Performers include: Zach Galifianakis, Martha Kelly, Louie Anderson, Sabina Sciubba, and Ernest Adams. A dark comedy, this TV series revolves around a struggling clown who lives in Bakersfield, California. 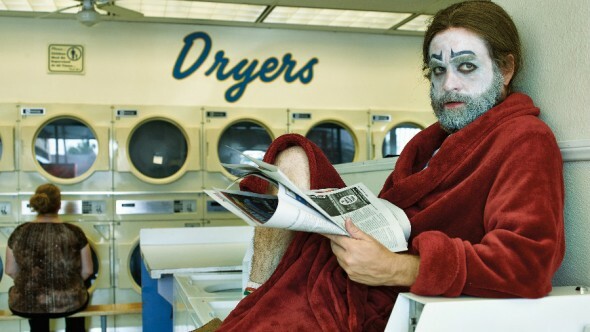 Chip Baskets (Zach Galifianakis) dreams of being a classically trained French clown. Unfortunately, things don’t work out for him when he goes to study in Paris — thanks to financial difficulties and an impenetrable language barrier. Chip moves back to his hometown and is forced to confront his past while working as a rodeo clown. He also must deal with his judgmental family. Chip competes with his siblings for his mother’s approval and affection. Christine Baskets (Louie Anderson) is the matriarch of the Baskets clan. She cares deeply about appearances and finds herself constantly embarrassed by Chip and his non-identical brother, Dale (Galifianakis). Christine is so embarrassed by them that she adopted a younger, better set of twins so she’d have something good in her life to brag about. Martha Brooks (Martha Kelly) is a low-key insurance claims agent. She believes that she’s Chip’s friend but he disagrees. In truth, Martha’s the only one that tolerates his rude and angry behavior. Penelope (Sabina Sciubba) is a bohemian artist that comes from money and Chip’s French sophisticate wife. She doesn’t love him and isn’t shy about reminding Chip that she only married him to get her green card. Eddie (Ernest Adams) is the owner and manager of the Buckaroo Rodeo where Chip works. To be honest, he’ll hire anyone who’s willing to risk their health for a low-paying job. Still, Eddie sees something in Chip and often offers him cowboy wisdom to help solve his problems. He promotes Chip to “head clown”. What do you think? Do you like the Baskets TV show? Do you think it should be cancelled or renewed for another season? Do not cancel. This is a funny show. Zach, Louie, and company put forth a unique product each week. I absolutely love it. Do not cancel. I have enjoyed every minute and every reference to all things the average person in American relates to today…..Costco, our home away from home, clowns, once everywhere, gone and now back with all the interesting ins and out of life, and of course Christine who is so captivating……she doesn’t miss a beat. Loved her confrontation with Chips French wife especially the large shadow she cast on the pool. PLEASE DO NOT CANCEL THIS SHOW….